Whether you prefer a new condo on Longboat Key like the waterfront complex at Positano or a re-sale condo like luxurious Water Club, you can search all the Longboat Key Condos listed in the Sarasota MLS database of condos on our blogs or on our websites! Take a look at some Longobat Key condos and see if this manicured island is your dream lifestyle. If you don't have time to search, email us your preferences, and we'll automatically send information on Longboat Key condo communities that match your criteria. The Sarasota MLS reports over 400 two bedroom, two bath condos, townhouses and villas for sale. Prices currently range from $239,000 to $5 million for a minimum of two bedroom, two bath condos. Of course, the closer to the water, the better the condition of the condo, and the more fantastive the view, the more expensive. 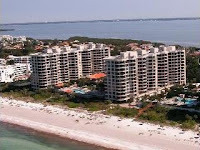 It's all about the water and most of our customers prefer the Gulfside of Longboat Key. The Bayside of Longboat Key is wonderful too! Waterfront condo residents on the Bay enjoy boating activity as well as twinkling city lights in the evenings -- there is more to see when the sun goes down. St. Armands Circle's activities and downtown cultural venues are a short drive away. If you are interested in a Longboat Key condo or any Sarasota real estate, contact Annette Smith at 941-504-3922 for showings.